What they're saying: Why haven't the Eagles signed a running back yet? The Eagles are still in need of running back help. Could Jay Ajayi be the answer (again)? If you look around the internet at the various grades being handed out to the Eagles for free agency, they might not be as high as you'd expect. Sure, there are some who think the Birds' offseason has been among the best in the NFL so far, but more and more those reactions are looking like the exception rather than the rule. But to the cynics (some might says realists), like our own Jimmy Kempski, who gave Howie Roseman and the Eagles a C+ for free agency, the fact that the Eagles were unable to grab a running back off the market is a glaring red flag, as was the Eagles' decision to hand out contracts to a bunch of players who are on the wrong side of 30. There is, however, still time for the Eagles to make a move at running back before next month's draft, although the available names are less than thrilling. Like, for example, Jay Ajayi, who spent the last season and a half with the Eagles, but missed the second half of last season with a torn ACL. 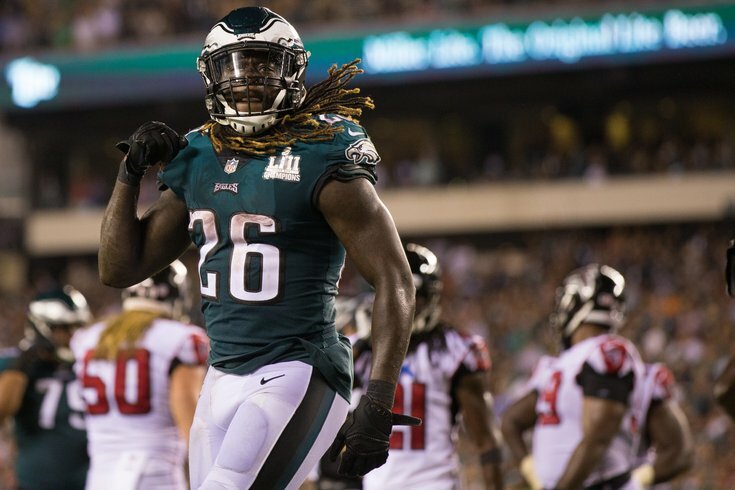 According to Les Bowen of the Philadelphia Daily News, agent Drew Rosenhaus is leaving the door open for Ajayi, who recently visited with the Colts but left town without a deal, to return to Philly this season. Agent Drew Rosenhaus says Jay Ajayi’s visit with the Colts last week went well, but, obviously, no agreement reached yet. Says he is maintaining discussions with the Eagles. Expects Ajayi to be ready for the start of the season, probably not much before that. Ajayi, who has struggled with injuries throughout his career, has a ton of potential — when he can stay stay on the field. And it's obvious that a healthy Ajayi is better than anything the Eagles currently have, which looks a little something like this: Corey Clement, Wendell Smallwood, Josh Adams, Boston Scott, Donnel Pumphrey. Over at BGN, BLG took a look at what to make of the Ajayi news from Bowen. And, of course, it should be pointed out that Ajayi likely won't be healthy until at least the start of the season — and given the severity of the injury, there's no guarantee he's even ready by then. This update from Bowen hardly reads that an Ajayi re-signing is imminent. But it is worth noting that the Eagles have been active at the NFL owner meetings in the past. During the 2017 meetings, the Eagles signed Patrick Robinson and Chris Long. Maybe Howie Roseman and Rosenhaus will find the time to meet in person and talk about Ajayi’s status this week. Jeff McLane recently wrote about the Eagles' running back situation, and had an interesting tidbit on the guy many Birds fans were expecting the team to sign this offseason, former Falcons back Tevin Coleman. According to Jeff, the Eagles were indeed zeroing in on Coleman before he signed a relatively cheap contract in San Francisco. If nothing else, that makes the Eagles inability to sign Coleman even more confusing. They had the money — certainly more than what the 49ers offered him — plus they had a need at the position and had already identified him as the guy they wanted. So, assuming that they still place a little value on the running back position, why were they unable to get a deal done? ... so why didn't they get him? Sometimes segues are just the best. Howie Roseman is scheduled to speak from the owners meetings at 7:15 p.m. on Monday night, and Zak Rosenblatt of NJ.com's first question for the Eagles' top decision-maker will be precisely the one we'd like answered as well. 1. Why haven’t you signed or traded for any running backs yet, namely Tevin Coleman? What's Howie up to now? Buckle in, because this is by far the most interesting story of the day, especially for anyone interested in knowing why Howie Roseman is so good at his job. In the often-baffling world of NFL contracts, Eagles vice president of football operations and salary cap guru Howie Roseman has been designing contracts with fake years, a tool that spreads out cap hit into contract years that are guaranteed to never exist. You had me at "fake years." So what is Roob talking about? Well, let's take a look at Ronald Darby's recently-signed five-year contract, which has a base salary of just $1 million in 2019. That number than explodes to $15 million per year for each of the final four years (2020-2023). Between his pro-rated $3.5 million signing bonus, expected roster bonuses of about $1.125 million, and the $1 million base salary, Darby is going to count for just $2.825 million against the cap this season, according to Frank. That's where things get interesting. See, the remaining four years on Darby's contract are the "fake years" — fake, as in they'll never happen. The contract states as much. The small print in Darby’s contract states simply that the 2020 through 2023 seasons “void automatically” if Darby is on the Eagles’ roster 23 days before the start of the official 2020 league year, which would be sometime in late February. In other words, if he’s on the team, he’s no longer on the team. And the $60 million base salaries? They evaporate. They disappear. And while the contracts for Malik Jackson, DeSean Jackson and Brandon Graham are all different, Howie is using a similar strategy to save money in the short term by deferring it to later years in the contract, when the salary cap is going to be higher and therefore somewhat easier to manage. So what exactly is Howie saving by doing this? Darby’s 2019 cap hit would be $5.625 million instead of $2.825 million. Malik Jackson’s would be $4 million instead of $2.8 million. DeSean’s would be $4.12 million instead of $3.164 million. Graham’s would be $5.17 million instead of $3.5 million. I almost certainly butchered Roob's column here because I was afraid of taking too much (and I still feel like I did, but it's definitely a story that needs some context). So if you're still confused about what Roob is talking about, I highly recommend reading the whole things over on NBC Sports Philadelphia.